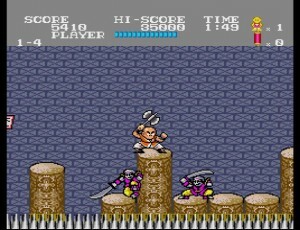 Tiger Road is a 1987 Capcom arcade game ported by Victor to the TG16 in 1990. I got the game less than a week ago, and beat it yesterday. That didn’t take too long… The game is one of the only platformers on HuCard on the Turbografx with backup memory save support, if you have a TurboBooster Plus or TurboGrafx CD drive (or any variety of Duo), which is awesome. 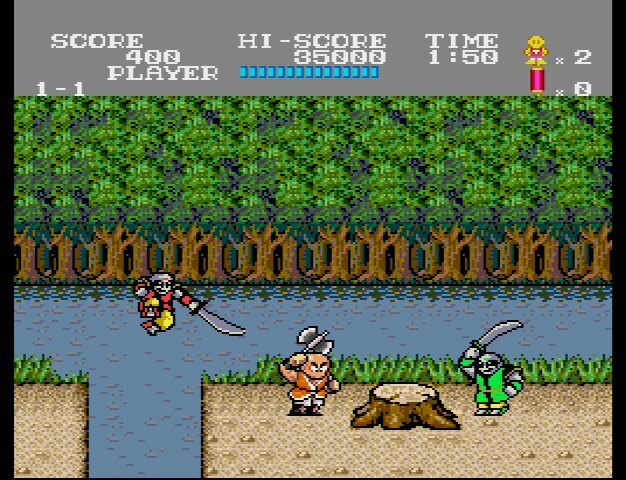 In the game, you play as a monk warrior fighting your way across what I assume is China, trying to defeat the evil king who has kidnapped the children. You fight all kinds of Chinese monters like Chinese zombies and dragons, and Japanese ones as well like Ninjas. There are three different weapons, all with two upgrade levels, and a fourth you can unlock later in the game. It’s frustrating and hard, but I like it. The game gets a lot of mediocre to poor reviews, but really, I think that it’s a pretty good game. I must admit, though, I made use of the backup save feature for saving and infinite continues. I don’t know that I’d ever beat this game “legit”, with no saving and with the 5 continue limit you have if you’re not using a system with saving, but, well, the option for saving and infinite continues is there, with that addon hardware, and I have a Turbo CD, so I’m definitely going to make use of it! It continues you from the stage section you’re at, so you never have to replay a stage part that you’ve beaten unless you want to challenge yourself with the non-saving version of the game and really want to memorize everything, though with how the enemies spawn infinitely, this isn’t a 100% memorizer like R-Type or Jim Power, you will have to use luck and skill as well as memorization to finish this game. I mean, Tiger Road is HARD. It’s as hard as you’d expect for a Capcom arcade game from that era, considering that they also made games like Ghosts & Goblins. 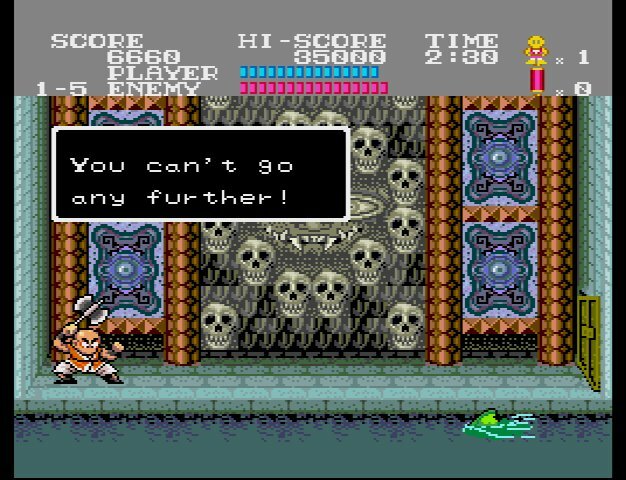 Some things feel Ninja Gaiden-esque, except this game is older. It’s got knockback, which always seems to hit you into a pit, infinitely spawning enemies driving you crazy, enemies attacking from all directions, frustrating bosses which can absorb a large number of hits, and more… it’s a tough game. Fun, but tough. The game has good graphics for a midlife TG16 HuCard game, with the bright, vivid colors you expect from games on the system. I like the music as well; it is repetitive, and the sound effects are mediocre at best, but the music works well and isn’t too bad. It’s fittingly Chinese in style and fits the game’s atmosphere well. There are also bonus minigames between levels, which are simple but a nice diversion (the ‘defeat the monks’ one particularly, the other minigame is kind of easy to beat with the turbo switch on, and in this game turbo will probably be on on the attack button the whole time you’re playing). Even though he is on a quest, our hero is still in training to the Ancient Master. The weapons are a mace, a spear, and an axe. The axe is the default weapon, but you collect the others via red powerup boxes. Other powerup boxes are yellow, but those won’t contain weapons. (On that note, don’t pick up the yellow “health” powerups! They actually cause you to lose health. Only grab the blue or red ones.) Another powerup upgrades the power of your weapon, and if you succeed at enough end-of-level minigames, the Anicent Master will give you a new, more powerful weapon, the tiger shot. You’ll lose this once your health gets too low (until you die and come back, or get a health powerup), but still, it’s a great weapon, and a strong incentive to beat the minigames. There are only five levels, but each is broken up into many parts, and each level is longer than the last. 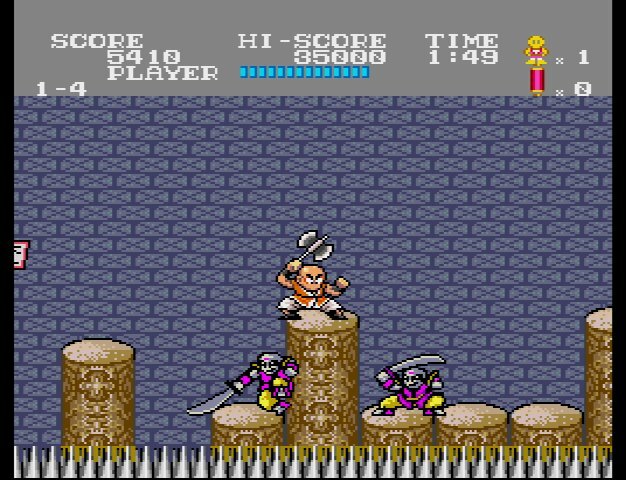 The last level is pretty long and has multiple bosses, including some returning from the earlier levels. Visuals and enemies do repeat, but there’s enough variety of environments and enemies to keep the game interesting, I think, and it all looks pretty nice. Bosses are a bit annoying though, as I said; each has as many hit points as you do, except you take a lot of damage when hit, while they usually take just one HP per hit, so you will need to hit them many times before they’ll die, while avoiding taking much damage. The boss fights can get a little long, and the first few are easy too — not a good combination. Still, the later bosses provide a definite challenge. Overall, it’s a good game. It is fun and challenging and kept me coming back until I finished it, despite great frustration in a few of the later areas. It’s a simple game, like most TG16 HuCard platformers, and it deserves its reputation for high difficulty, but it is good overall, particularly for anyone with a system that can save. The save feature is really awesome to have, in my opinion. I really do prefer to be able to save in games, and far too many 16-bit platformers not on the SNES didn’t have saving… Oh, and it doesn’t just save your progress (it autosaves at the Game Over screen, so wait for that if you want to save), but it saves your top four high scores, too! Pretty cool, high score save is VERY rare on the TG16. I give it a 80%. It’s good, but not great; the game is a little short, and replay value is somewhat limited, unless you want to try to play it with only five continues and no save. Also while the graphics are good they probably could have been even better, and the sound effects definitely are a little weak. Also, of course, while it is fun, the game also gets very frustrating at times. However, I do like the game, and it was worth getting. This entry was posted in Full Reviews, Reviews, TurboGrafx-16 and tagged Capcom, NEC, platformer, Review, Tiger Road, Turbo Grafx, TurboGrafx-16, Victor Interactive. Bookmark the permalink.